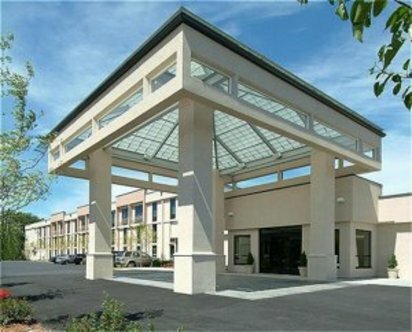 The Holiday Inn Brockton, MA is located off Route 24 and less than 30 minutes from downtown Boston and Logan Airport.. The hotel is centrally located between Foxboro, Plymouth, Cape Cod, Boston and Newport and Providence RI .We are located in theWestgate Mall featuring numerous stores, several restaurants, bowling and billiards. We are five minutes away from five golf courses and our local baseball team The Brockton Rox . Our Guests can relax in our oversized indoor pool and hot tub or work out in our fitness center. The Holiday Inn Brockton features The Grill Restaurantspecializing in American and Middle Eastern Cuisine. The restaurant provides a great atmosphere where you can catch a game on our plasma televisions, play Keno or listen to great entertainment. Business meetings and social functions are easily accommodated by our 5,000 square feet of banquet and meeting space and beautifully landscaped outdoor courtyard with gazebo. We can accommodate 5-200 people for business meetings to Weddings and everything in between. The hotels 189 newly renovated guestrooms feature complimentary wireless high speed internet access, and are tastefully appointed with all the comforts needed to create that Home away from Home feeling This hotel is committed to providing accessible facilities under the American Disabilities Act. If your accessibility needs are not met, please contact the Hotel Manager on Duty. Should you require additional information regarding accessible facilities for guests with disabilities, please call 1-800-Holiday (U.S. and Canada) or contact the hotel directly. For the hearing impaired, TDD service is available at 1-800-238-5544 within the U.S. and Canada.